This text/reference book provides the most comprehensive coverage of anticholinesterase compounds (Organophosphates and Carbamates), which constitute the largest number of chemicals that are primarily used as insecticides in agriculture, industry, and around the home/garden. Some OPs (nerve agents) have been used in chemical warfare and terrorist attacks, while some OPs and CMs have been recommended as therapeutic agents in human medicine as well as in veterinary medicine. Many chemicals of both classes are extremely toxic and lack selectivity, thus their inadvertent/accidental use continues to pose a threat to human and animal health, aquatic systems and wildlife. These anticholinesterase agents produce a variety of toxicological effects in target and nontarget organs. In light of this complexicity, this multi-authored book is written by the well known scientists from many countries. The book is organized into nine sections, with a total of 49 chapters, to provide in-depth knowledge on various aspects of OP and CM compounds, including their use, classification, mechanism-based toxicity, and prophylactic and therapeutic measurements. 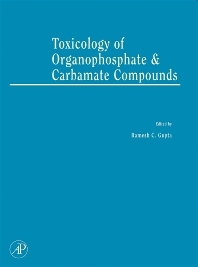 Several chapters are written with special emphasis to cover timely topics, such as chemical warfare agents, physiologically-based pharmacokinetic modeling, structure and function of cholinesterases, paraoxonase, carboxylesterases; developmental neurotoxicity, the intermediate syndrome, oxidative stress, endocrine disruption, and DNA damage/gene expression and carcinogenesis. Section-VI with 5 chapters is specifically devoted to risk assessment, and safety and regulatory guidelines for pesticides. Dr. Ramesh C. Gupta, Professor & Head of Toxicology Department at Murray State university, is engaged in research on pesticide toxicity, neurodegenerative diseases, and nutraceuticals efficacy and safety. He has delivered lectures in UK, Australia, Italy, Japan, Germany, France, Switzerland, Spain, Czech Republic, China, South Korea, and Sweden. He served the panels of NIH, CDC, NIOSH, and NAS. He has >400 publications to his credit, including seven major books: (1) Toxicology of Organophosphate and Carbamate Compounds, (2) Veterinary Toxicology: Basic and Clinical Principles, (3) Handbook of Toxicology of Chemical Warfare Agents, (4) Anticholinesterase Pesticides: Metabolism, Neurotoxicity, and Epidemiology, (5) Reproductive and Developmental Toxicology, (6) Biomarkers in Toxicology, and (7) Nutraceuticals: Efficacy, Safety and Toxicity. He is recipient of Murray State University's distinguished researcher award of the year-2006, and Outstanding research award of the year 2014. He is a diplomate of American Board of Toxicology, and fellow of American College of Toxicology, American College of Nutrition, and Academy of Toxicological Sciences. Dr. Gupta is a member of many professional societies, including SOT, Eurotox, ASPET, American College of Toxicology, and ISSX.